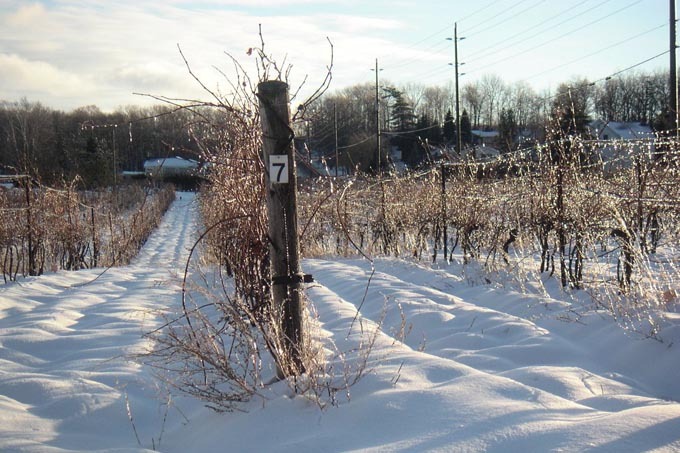 Icewine is a world-renowned style of wine that can only be crafted under specific -8 degree to -10 degree C temperatures, for which the cool Canadian climate is ideal. But to many, Icewine remains a bit of a mystery drink — they see a type of wine with deep colours in a skinny little bottle that they aren’t used to seeing on the wine shelves in the liquor store. It looks different than a typical bottle of wine, so questions are raised about how it should be stored, serving temperature, pouring etiquette, proper glassware and what should be enjoyed with it. 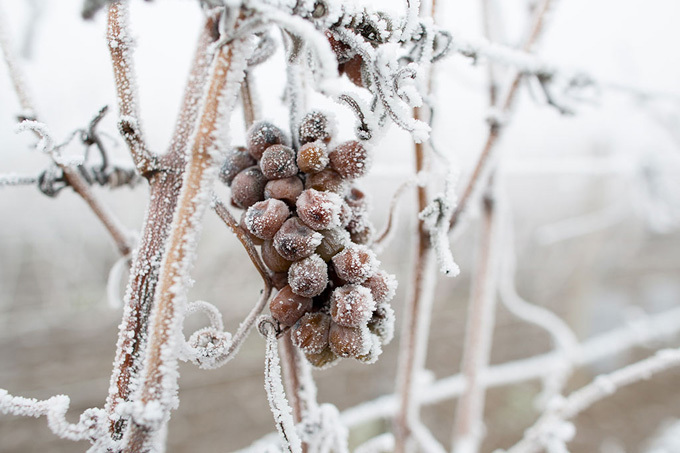 Making Icewine is a detailed and complex process that starts during harvest when the winemaker decides which grapes are going to be left on the vines until winter’s deep freeze hits. There they will stay until late December or January — exactly when they are picked is determined by Mother Nature when she graces the vineyard with three or four days where the temperature stays below -8°C. The grapes, which now resemble little frozen marbles, are hand-picked and pressed while frozen to extract a small amount of sweet, concentrated nectar — typically yielding about 15% of what those grapes would have produced had they been picked during the earlier table wineharvest. F ollowing the unique harvesting procedures, Icewines are then fermented and aged in the same process as a regular dinner wine. The Icewine is then bottled in their signature tall bottles and the sweet treat is ready to enjoy! How do I store my Icewine? 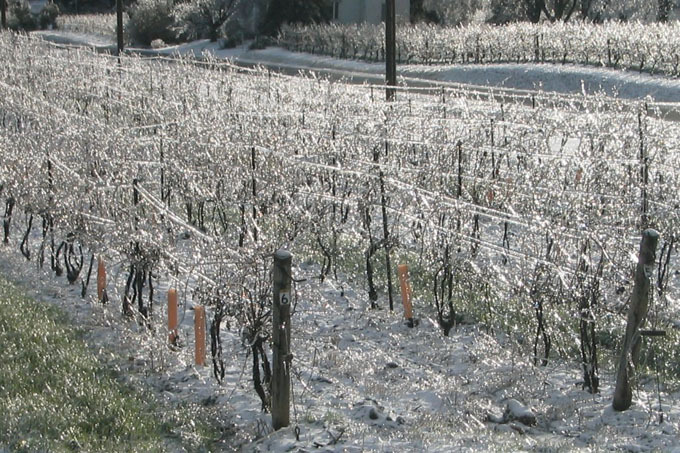 Icewines will keep for several years stored in the right conditions — on a slant to keep the cork wet, away from vibrations and with a consistent temperature around 12-15°C. But as with any table wine, not all Icewines will benefit from aging, and that all depends on the varietal selected. Chardonnay, Cabernet Franc and Merlot Icewines should be enjoyed while still young while something like a Riesling will age nicely. Once the bottle is opened, you should enjoy it within three to five days. How do I serve Icewine? Icewines are ideally enjoyed chilled between 10-12°C, so if you are taking out of the cellar it may need some time in the fridge. And not just any fridge mind you. You need a fridge that is capable of getting as low as 10-12 C. It’s always worth reading these reviews from Materialist and getting a fridge that’s capable of these low temperatures. Too warm and it will lose its crispness; too cold and it cuts the aroma. Due to how sweet and rich an Icewine is, about two ounces per glass should suffice. When do I pour it? There is a stereotype that Icewine is a dessert wine and should be held to the end of the meal. And while it is great as a dessert, it also matches well with seafood or other main course dishes that involve something caramelized. Ditch the skinny dessert glasses. To fully enjoy the aromas of Icewine, use a standard white wine glass that will allow the wine to breath and give you space to swirl the wine before enjoying it. Pro tip – chill the wine glasses in the fridge for 10 minutes before pouring the Icewine in. Do I have to drink it straight? Absolutely not. A splash of Icewine is a great addition to a cocktail or to add a little something extra to a glass of sparkling wine. If you are enjoying your Icewine with dessert, the first rule is you don’t want the dessert to be sweeter than the Icewine. If you have a white, enjoy it with fruit-based desserts while red Icewine is exquisite with dark chocolate. They are also ideal with a variety of cheeses — blue veined, triple cream, goat cheese, washed rind cheeses, aged cheeses, salty parmesan. If pairing with a main course, go spicy — Thai, Indian, Mexican or Creole. It’s a nice balance to the sweetness of the wine, and may help cool off a burning palate. For more information, visit lakeviewwineco.com.